grandma's cookie jar: Even More Dr. Seuss Quotes! Are you ready for a few more Dr. Seuss quotes? Since Dr. Seuss wrote a lot of books; we have a lot of quotes to think about . . . today the quotes are ones which do this . . . make us think! So . 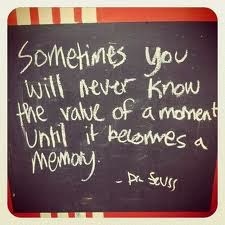 . . my Dr. Seuss quotes for today are . . .
― This quote helps me remember to appreciate those who do truly matter in my life! ― It can be easy for us to over complicate things and this quote helps me remember to, "keep it simple"! ― I LOVE this quote! It reminds me to pay attention to each moment and to treasure the memories! ― While Dr. Seuss likely did not have the Book of Proverbs on his mind when he said this, it does reflect the message of Proverbs. It is my prayer my grandsons will grow up to be men who are wise and who make the choice to follow God's way and not, "go down any not-so-good street"! ― It can be all too easy to become extreme, yet God's Word calls us to be people who are balanced; life is a "Great Balancing Act"! I also have to say I really think all of these sayings are great things to think and talk about with grandchildren to help them understand they can make a difference; even if they are still children! So, which saying do you like the best?